Chicago, Illinois - Greg Zanis (right) hugs Ziff Sistrunk at a memorial remembering the seven relatives that Sistrunk has lost to violence since 1972. Zanis, a retired carpenter, makes wooden crosses to remember Chicago's homicide victims. Chicago recorded 781 murders in 2016 and 664 in 2017. 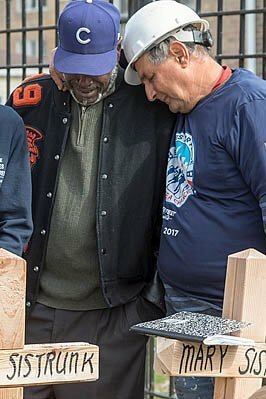 Image Description: Chicago, Illinois - Greg Zanis (right) hugs Ziff Sistrunk at a memorial remembering the seven relatives that Sistrunk has lost to violence since 1972. Zanis, a retired carpenter, makes wooden crosses to remember Chicago's homicide victims. Chicago recorded 781 murders in 2016 and 664 in 2017.